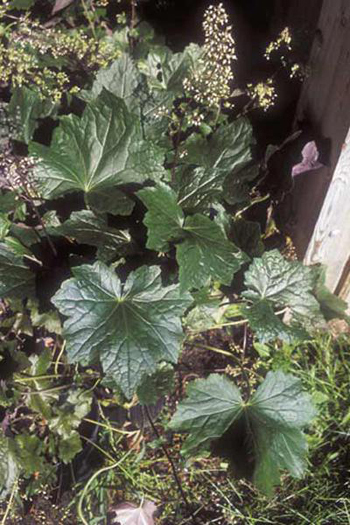 Alumroot is a perennial that grows to 1-3 feet; the leaves are toothed, roundish to somewhat maple-shaped, base heart-shaped. The flowers are small, greenish white, on short stalks; April to June. Another variety: Another plant called alum root (Geranium maculatum) is also called storksbill, but in fact has no relation to Heuchera americana. Woods, shaded rocks. Southern Ontario, Connecticut to Georgia; Oklahoma to Michigan. Not to be confused with cranesbill (Geranium maculatum) often called alumroot. 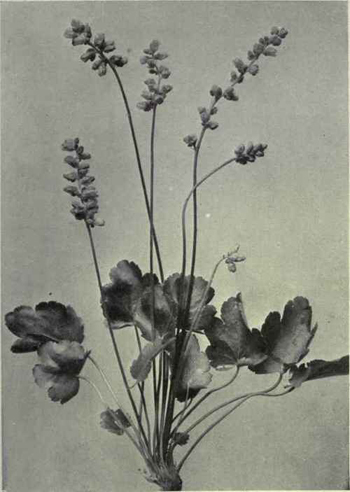 Native American uses: Alum root (Heuchera glabella) the Blackfeet called “Apos I poco,” the root was steeped for eye-wash. Another plant, (Huechera parvifolia), also called alum root, the root was pounded up and used wet to apply to sores and swellings. Leaf tea used for diarrhea, dysentery, piles; gargled for sore throat. Root poulticed on wounds, sores, abrasions. Good for gastroenteritis, stomach flu, and dry bilious vomiting, douche for leukorrhea, vaginitis. For dysentery, a cup of infusion may be taken every 2 hours until the symptoms have stopped. No more than 15-20 gms. of the powdered root should be taken at a time. Excessive use can cause gastric irritation and kidney and liver failure.